Switch things up with an incline dumbbell workout. Gravity will always pull your dumbbells straight down. There’s not much you can do about that. But if you change your body’s orientation, the angle of your body’s movement also must change, allowing familiar exercises to challenge your muscles in new ways. Inclined dumbbell workouts don’t pose any special risks, but as always, ask a certified fitness instructor to help perfect your form to reduce the risk of injury. 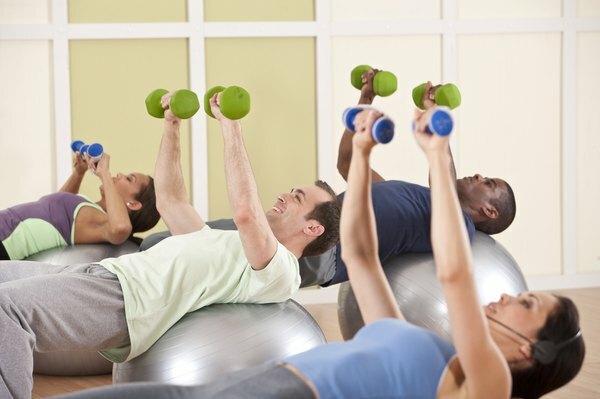 An incline dumbbell exercise isn’t a radical departure from its upright or supine counterpart. It’s a subtle variation that shifts the focus of the exercise. For example, imagine the movement involved in a dumbbell bench press as opposed to the movement of a seated shoulder press. 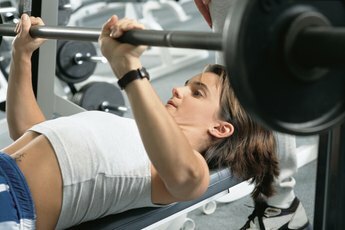 Both are pressing movements, but the bench press relies mainly on pectoral muscles in your chest, while the shoulder press focuses on the arm and shoulder muscles that propel the weight directly overhead. Now picture setting the incline of the weight bench about halfway between the supine and upright position. Performing a press movement at this angle divides the resistance more equally between your shoulder and chest muscles. Similarly, changing the incline of a biceps curl, bent-over row, chest fly or any other common dumbbell exercise can alter the focus and keep your muscles guessing. Assuming you already have dumbbells, the first step is finding an adjustable weight bench. Like flat benches, adjustable models have padded seats, but their hinged midsections allow you to set the seat back at different angles to perform a wide variety of incline exercises. If you have access to a gym, test different models to see which features will be important for your lifting routine. For example, some weight benches have fixed stanchions for holding barbells. These can get in the way during a dumbbell workout, so opt for a model with removable stanchions or none at all. Another versatile option is a Swiss ball, which also allows you to adopt different angles to jazz up your dumbbell workouts. And as an added benefit, your body will enlist even more muscle groups as it stabilizes itself on the shaky ball. Of course, lifting weights while balancing on a ball will result in a few spills, so avoid using very heavy weights -- unless you like forehead dents. Better yet, ask a fitness instructor to help you design a safe and effective routine. 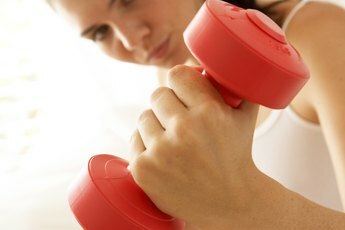 Weight Training for Dummies; Georgia Rickard et al.